Hello from David & Sheri Burns! 1. An update on Studio Bee LIVE! Going online this Saturday. a. We'd love to have sponsors. b. We'd like to answer some of your email questions or call inquestion for our first show. 2. A personal note about our family. Get to know us! STUDIO BEE LIVE coming online this Saturday. I love to listen to beekeeping audio files when I'm traveling or working, but there just isn't that much available. That's why we decided to start Studio Bee Live, to be a place where you can listen, be entertained and learn more and more about keeping bees. We will have these broadcast available to listen to online or you can download them in MP3 format to enjoy in your MP3 player or as podcasts. 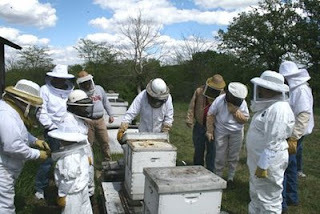 Each day we will produce a one hour broadcast on beekeeping, Monday through Friday. Each broadcast will have one main segment as the main topic of the day along with six daily smaller segments: Honey & Honey Receipts, Equipment, Bee Trivia, Bees In The News, A Look Back At Beekeepers and a Question & Answer segment. We also need your voice in our shows. We need you to send in your beekeeping questions via E-mail or call in your questions. Just give us a call today and our answering machine will record your question and then we'll play it with our answer on our show. For example, "Hi this is Chad from Ohio and I have a hive that did good this year, but I'm wondering if they have enough honey for the winter. How I can be sure and is it too late to open them up and look and see?" Questions like that. Sheri is my high school sweet heart. I met her when I was 16 and she was 14. On that day in 1976 I knew that Sheri was the girl for me! Her dad was very protective of his only daughter, and though I don't remember the exact details of a rule that he had, it was something like if I went to church on Sunday, then I was able to spend a little time with his daughter. Needless to say I became a Christian about a year later, not to win the pretty girl, but to repent and trust in Jesus. But then I did get the pretty girl. God is kinda like that. Sheri and I dated four years before we were married on August 3, 1980. Over the next 28 years we would both receive our college degrees from Lincoln Christian College, and find time to have 6 children (and now we have 4 grandchildren and another one on the way). I began pastoring my first church, and living in the parsonage when I was 21. We already had our oldest daughter, Jennifer then and had Jill 16 months later. Then we had our first son, David in 1985, our third daughter, Karee in 1991, Seth in 1993 and our newest edition to our family, Christian in 2007. We had our last two sons at home. Over the last 28 years of our marriage I have pastored churches in Illinois, Missouri, Ohio and for the last 13 years, back in Illinois. I have preached the gospel in the Dominican Republic, Mexico, India, Africa and on 5 teaching trips to Israel. The church I have pastored for the last 13 years now meets each Sunday on our honey bee farm, in our honey store. We are a home church that simply goes by the Bible. I preach each Sunday from our honey bee farm, and you are welcome to join us any Sunday at 10:30am Central Time. I share all of that with you so that you can get to know us a bit more, but also to let you know that it is a good feeling to have traveled the world and yet find the greatest joy in working on our family farm with honey bees. I guess you might say we are just good ole, down home country folks. Right now, Karee, Seth and Christian are our only Children living at home with us, and they are a huge help with our honey bee business. Seth started building frames in our business back in 2005 at just twelve years old. Now he's 15 and along with me builds every component in the hives we make. He exclusively builds all of the bottom boards, inner covers, top covers and frames. Seth holds the farm record for the fastest to build frames. He holds the record at assembling a frame (8 staples) in 16 seconds. In a pinch, Karee steps in and builds inner covers, frames and top covers. Last spring, during our busy season Karee really put in some long hours. Now, we have found a way to free up Karee so that she can continue to work only in the queen rearing operation on our farm. She knows the inside of a hive better than anyone! She can find young nurse bees to be used as a queen attendants quicker than anyone! Almost every day this summer she was out in hives picking out queens and young nurse bees and loading them up in their little shipping containers. She rarely was stung and a few times I fussed at her for not wearing a hat and veil. She is great! Sheri, my high school sweet heart, does it all, but mostly the paper work, online orders, phone calls, and usually single-handedly is the shipping department. Most days she is the one packing the boxes and labeling them too. When it is really busy, we all stop and become the shipping department around 3 p.m. and work feverishly to try and beat the arrival of the UPS truck around 4 p.m. Sheri also feeds my kids, feeds me, my dogs, my helpers and she feeds my bees when they need it. She's a wonderful cook! 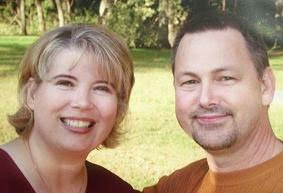 Dustin, my son-in-law, (Jennifer's husband) now helps us with our web site and data entry. The poor guy...I sorta dump a bunch on him at once, kinda like numbering books in a full library. But we are trying to get our data base updated so when you call, we can easily look you up. Finally, there's Callie and April, our two hound dogs. They are our long lane alarm system. As soon as anyone turns into our 1/4 mile drive, they bark and let us know we have a customer. They are respectful of all the hives on our property. That's us...On now to protective clothing. Even though bee stings aren't as deadly as some think, it still hurts and you'll turn red, itch and swell up. This happens to almost everyone. Wearing protective gear can prevent most stings. The first defense against being stung is to always use a smoker! Blowing cool smoke into a hive and onto the bees prior to working them is your best protection. I can work bees without any protective clothing if I smoke them first, but not if I do not. The second defense against being stung is to keep gentle bees. There is no reason to keep a hive that is aggressive. Re-queen a hive that is mean with a more gentle queen and in 30 days the eggs that she lays will emerge to be gentle too! Near the end of this year's bee season, I had requeened all of my hives and because we raise our own queens, I was working my bees with limited protection and no aggressive tendencies from my bees. But let's say you don't want to worry about requeening and you just want to wear some protective gear to keep from being stung. Sometimes, especially when removing hives from homes, more protection is necessary. We always recommend you wear a hat and veil. A hat and veil together will run you between 30-40 bucks. But, it is a very wise investment. No one wants to get stung on the face or head. 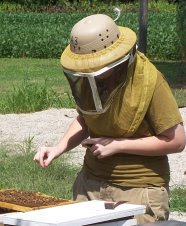 Most beekeepers use the cheap plastic pith helmet with a veil. The helmets are pretty common but the veils can be different. Some have square screens in the front, as in this picture, while others don't. Some veils only come down just to the neck, while others come all the way down to the chest. The style that you choose for the hat and veil is up to you. The next level of protection is a jacket with the hat and veil built in. These are nice, and are often referred to as an inspector's jacket. They look kinda like a parka jacket. You can unzip your veil and the hat/veil drops behind you and stays attached, as in the picture. I've unzipped the hat and veil and have laid them back out of the way. The next level of protection is a complete bee suit. Generally it is like the jacket but includes the pants. Bee suits are not totally sting proof. 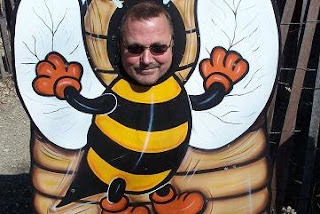 Though it is very rare, it is possible to be stung through a bee suit. Again, it is almost impossible, but can happen and did happen to my son once when we were removing a hive from a house. So whether you wear a hat and veil, a jacket or a suit, you'll probably change what you wear after you work your bees a few weeks. Suits and jackets are very hot in mid summer, so do keep that in mind. It is best to choose a fabric blend such as cotton/polyester blend that is cool. You may want to get one size larger than you normally wear because suits and jackets go over your regular clothes. In this picture, you can see that among a group of beekeepers, there are many different configurations. A low budget idea is to buy a real inexpensive painter's suit from Menards or Lowes. These are made of material that does not last for every, but probably at least one bee season. I've used them. They can tear easily, but they are white, very thin painter's suits. They do not have a hat or veil, and a bee could sting through it, but they are white and bees just do not like to land on white. I always wear a very light colored shirt and bees stay off. Bees have an instinct to attack black. To make sure queens are gentle, breeders wave a black cloth over the top of a hive and then counts the stingers on that cloth. The hive with the fewest stings are the more gentle hive. 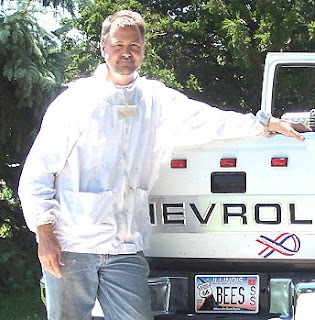 Bees are "wired" to defend their hive against black bears so wearing a white painter's suit can be a low budget solution. If you are afraid of being stung on your hands, there are many different types of bee gloves with longer sleeves to tuck beneath your suit. Most are sting resistant, meaning a bee might be able to sting through the glove, and others are sting proof which means a stinger cannot penetrate your gloves. But, as you would imagine, the gloves that are sting proof are not the easiest gloves to work a hive with. They are big and clumsy and you look like a Haz-Mat worker. When gloves this awkward, you accidently smash more bees and that makes them more aggressive. When I have to wear gloves I wear a pair of leather work gloves and duct tape the space between my gloves and my suit. I've never taken a sting through a leather work glove. We sell hats, veils, jackets, suits and gloves so feel free to give us a call. It was nice to be with you today, and thank you for checking in.